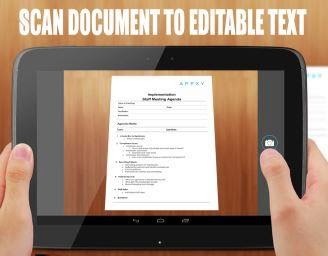 There are many android apps available that can scan your document to pdf through your device camera but very few can convert the scanned text directly to editable text. One of the few that can perform this task very efficiently is the simple “ScanToText” app. This app can intelligently recognize all typed text in any picture and convert them to editable text which you can share with any other app on your devices. It allows you to either choose a picture from the gallery or snap your document with your camera and it is 98% accurate on a clear typed font-face.